Is this Heimdall 2.0? Remember when white supremacists boycotted the casting of Idris Alba as a Norse god in the film Thor? Elba’s selection as comic book character Heimdall was met by opposition from so-called purists — who can manage to wrap their tiny minds around a hammer-wielding god that moves between planet Earth and fictional planet Asgard in a bid to protect humanity from evil but who cannot fathom a black man playing the role of a guardian sentry (i.e., a glorified butler, albeit in a fierce uniform). This time around, The Hunger Games, based on the wildly popular young-adult novel written by Suzanne Collins, is at the center of the conflict. Fans of the novel-turned-Hollywood blockbuster set Twitter on fire upon learning that black people were playing three characters — Rue, Thresh and Cinna — in the film. 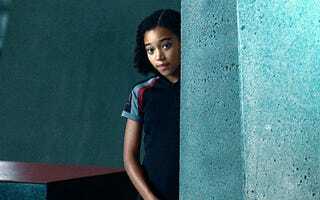 In the novel, Rue is clearly described as having “dark brown skin and eyes” and “thick, dark hair.” Thresh is described as having the same “dark skin as Rue.” The characters of Rue and Thresh are portrayed by 13-year-old actress Amandla Stenberg, who is black and white, and Nigerian-born actor Day Okeniyi. Cinna, the other black character in the film, was not described racially in the novel but is played by rocker-turned-actor Lenny Kravitz, who is black and Jewish. At least the last commenter has the good sense to hate himself. For those who don’t have the good sense to hate themselves when making stupid comments about 13-year-olds, then how about not saying anything? It’s pretty scary to think that even in a supposedly creative space like filmmaking, which stuck pretty closely to the character descriptions in the novel, that the filmmaker’s casting choices are being met with such racist banter. Rue was described as “dark brown” — shouldn’t they be saying that Stenberg is too light? Kravitz’s character was not even described in terms of skin color in the novel, so what does it matter? In my mind, the actors are appropriate for the descriptions given for the characters in the novel. I think it’s great that they represent the diverse range of beauty found in the Diaspora. Aside from that fact, exactly how much of a jerk and a racist do you have to be to make such tweets about a 13-year-old? That’s what is ridiculous, not the casting of blacks in roles for characters with “dark skin” and “thick black hair.” I won’t even mention how creepy it is that “fans” are unwilling to suspend disbelief in a medium predicated on the suspension of disbelief. Can you say “insanity”? I suppose only an insane person would attack a 13-year-old or a Web series that they had not seen, which is what happened to rising star Issa Rae of The Misadventures of Awkward Black Girl. While Rae’s series isn’t science fiction, the show is on the Web, the new frontier in media. Rae’s series won the top Shorty Award for best Web series and was immediately blasted with racist Tweets. Rae posted a snarky commentary on xoJane in response to the critics, who called her a “Niggerette” and said, “Of course the black one wins.” Rae fought back during the attack by tweeting, “Losers be triiiiiiipppppppiiiiiiiiiin,” reminding us of the beauty of her show’s character J, who speaks to the awkward black girl in all of us. Like Stenberg, Okeniyi, Elba, the filmmakers behind Thor and Hunger Games and novelist Suzanne Collins, Rae is trying to create a world where awkward black girls exist. The resistance of so-called fans to include people of color, even when the description of a character calls for one, shows just how much of a disease racism is in our society. It is oozing out of our pores when dynamic black folks like Rae, Stenberg and Kravitz are being attacked for playing a role or creating a role that challenges popular notions of who we are, even in genres like science fiction and mediums like the Web. Racism in science fiction is not new, but the willingness to publicly assail actors on social networks for not reinscribing a world where people of color are welcome only by invitation is pretty pathetic. Rae said it best. It’s too bad that the haters haven’t figured out that their ignorance and extremism make it possible for folks like Rae to succeed by motivating them to create change, even in popular culture. In the words of Awkward Black Girl’s’ J, “losers be triiiiiiippppppiiiiiiiiing, winners be wiiiiiiiiinnnnniiiiiing.” Until the haters are able to wrap their tiny minds around that factor, Rae, Stenberg, Okeniyi and Kravitz will prevail in fantasy and reality.